Tired of failing at your New Year's Resolutions? Here's some ideas that can really help! 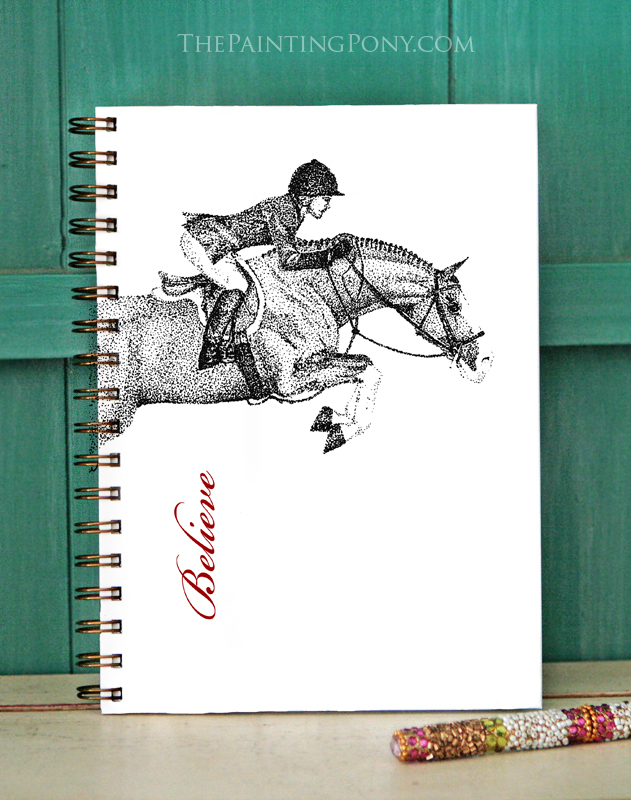 Late last year, The Painting Pony added a selection of brightly colored, equestrian themed bullet style journals! What is a bullet journal you ask? A bullet journal is the ultimate YOU book; it is a mix of a planner, diary, massive to-do list, and a sketchbook all wrapped up into one organized, private accountability partner in the form of a book. It’s an extremely thorough way to stay organized, on top of your work, and be goal-oriented all in one place. The new bullet journals from The Painting Pony feature pages with dot grids, or blank pages if you prefer, for the bullet journaling junkies out there so they can target goals, make lists, and journal their life to their heart’s content! With gold metal spiral binding and hard covers, these journals are not only attractive, but functional too. To help inspire you on your own bullet journal journey, we’ve compiled a list of our favorite top ten ideas to help get you started using a bullet journal to document you life and set goals. Start a new journal every year. On the first page create a list of things you’d like to do as a type of bucket-list for the year. Make another list of life-goals you’d like to reach such as job promotions, weight loss, financial goals, projects you want to do etc. Add drawings and pictures to illustrate your goals. Be sure to include your horse-goals too like mastering certain movements such as flying changes with your horse, winning a certain number of blue ribbons at competitions, or just riding more often. But don't stop there, on each Goal's page - write out a list of HOW you're going to reach that goal and then track those smaller steps on the page to keep you on-track. 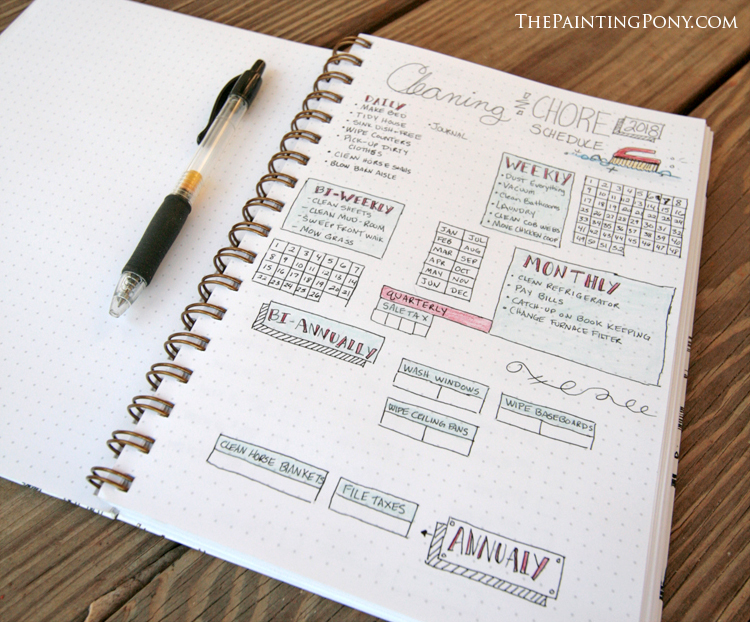 If you’re a fan of having a clean house, but struggle to keep up with all the chores, this idea is for you! Making a list and schedule of what needs to be done and when can be very helpful. If you're looking to reduce chaos in your life, then give this a try! Make different lists for daily, weekly, bi-weekly, monthly, bi-annually, and annual tasks so you can check each off as the year goes on. A bullet journal for the barn might include worming schedules, washing the water buckets, troughs, striping stalls, and doing the horse laundry. Track your rides with your Horse. Make a spread with color codes and daily check boxes for the whole year to keep track of how often you are riding and your level of activity to help you track you and your horse’s physical activity. Add color codes for different exercises so you can keep track of what you did such as yellow for flat work, green for jumping, and blue for hill work etc.The layout featured above displays a log for one month with the days in a list-type and color codes to log the type of work done and an a place next to it to give details on how it went. This information can be used to track your horse's moods and performance levels. 4. Make a Monthly Calendar. Add a page for each month of the year with a calendar drawn out on each page with the dot grid. Add illustrations and text to embelish each month, then color it in as each month goes by. Be sure to add in birthdays, anniversaries, and other important dates and holidays as well as any horse shows or clinics you want to go to of course! The layout shown above has the dates in list-format with daily habit listed at the top so you can color in each day those habits were performed. This is great to keep track of eating healthy, things you want to do more like have quiet time each day, spend time reading, brushing teeth, flossing, drinking more water, and anything else you want to track each day. (Combined along with the monthly calendar seen in the above layout) Make a monthly grid with a box and line for each day of the month with habits you want to keep track of such as riding your horse, eating sugar-free, doing cardio, making your bed, taking vitamins, reading your devotionals, picking up the house, journaling, eating at home, going to bed before 10pm, etc. Color in each day that you did that activity with a different color. Then you can look back on each month to see how often you’ve kept up with that activity throughout the month so you can see the areas you did well in and where you may need to improve. Also shown above with the previous two ideas in a combined layout. To help you reach your New Year Goals listed on the first few pages of your journal, make a spread for each goal you would like to reach. Add daily, weekly, or monthly time-scales to check off or meter bubbles to fill-in as you reach your goals. This adds a visual incentive so you can easily see how close you are to reaching your goals. Ideas: Track savings, weight-loss, show points you've won to win year-end awards, etc. Add a few pages with each week of the year in grids. In each grid, make a list of meals you want to plan for the week with the day you want to have it. You can then grocery shop in advance based on the week’s meals you want to have. To go with your meal planner (previous picture), make a shopping list for each week to reference when you go to the store! Add a page with things you are praying for or make a list of what you are thankful for each week as the year goes by. When each prayer gets answered, color in the area you’ve designated for that prayer. Then you can look back over the year to see all prayers that have been answered and use it to build your faith up during times when you might feel weak. Wright in bible verses to help inspire you and stand in faith as you pray over the items on your list. Make a page spread with a line for each week with the total to put away for that week. As each week goes by, check it off as you have set aside that money amount into the savings. The object of this goal is to set aside a certain amount each week into savings. Usually this is done with $1 the first week, $2 the second week, etc. But to make things easier, start with the higher amount at the beginning so that as the year goes by, the amount you have to set aside is less and less which makes it easier as the year progresses instead of harder. This makes it more likely that you will keep-up with your savings goal instead of abandoning it later when things are harder when the amount goes up each week as this method is normally done. IE: Week one put away $52, week two: $51, week three: $50, etc. on down to week 52 where you would only have to put away $1. To see all of the bullet journals to choose from and get started on your own bullet journal experience, click here!